One of my favorite features of the Venice Film Festival is its Classics section, which this year featured 19 restored films, four of which I saw. Four and a half, actually, I guess … I’m gutted about having missed Antonioni’s “Red Desert,” Lubitsch’s “Rosita,” and Walsh’s “The Revolt of Mamie Stover” (don’t look at me like that, I’m a big Walsh man) but I’m so glad to see what I did. One of the pictures was the absolute best I saw at the festival. I began with “The Old Dark House,” a thriller on that exact theme directed by James Whale in 1932, one of the films he made in the interim between “Frankenstein” and “Bride of Frankenstein.” Like those two films, this one stars Boris Karloff, here in the menacing role of a mute butler who becomes very brutally overexcited when the unwanted visitors entering the creaky House of Fenn on a stormy night include not one but two attractive young women. One of whom is played by Gloria Stuart, later of “Titanic” fame and looking very fine, albeit nothing like Kate Winslet, in her much younger incarnation. This is the archetypal horror comedy, or would be had it ever been equaled. Ernest Thesiger is genius incarnate as the house’s very nervous master Horace Fenn, while British stage actor Eva Moore is an exemplary crone as his religious fanatic sister. The movie brims with quotable dialogue, including the immortal line “Have a potato.” The restoration, produced by U.S. outfit Cohen Media, looks dazzling. 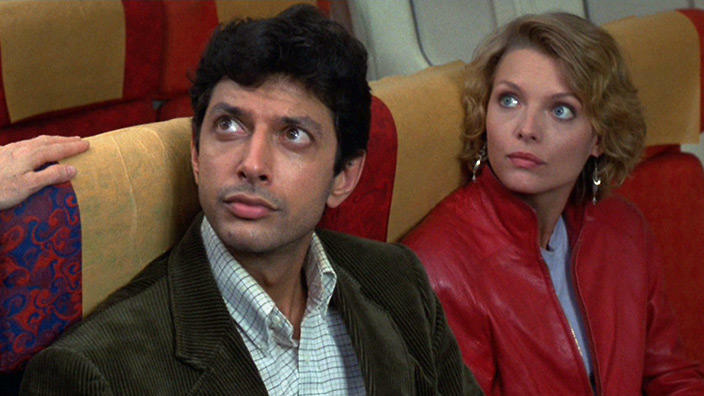 One of the jury heads this year is John Landis, and Darren Aronofsky’s “mother!," which features Michelle Pfeiffer, is premiering here, so now I see the sense of the screening of a restoration of 1985’s “Into the Night,” a quasi-Hitchcockian thriller directed by Landis and co-starring Pfeiffer and Jeff Goldblum. The movie’s premise is great—Goldblum’s insomniac everyman is lured into an all-night chase by Pfeiffer’s mystery woman—but its execution is all kinds of weird and morbid. The rhythms are logy, the cameos are too insistent (the novelty value of a knife fight between David Bowie and Carl Perkins is highly diminished before it even happens), and sparks fly between the leads too infrequently. It’s still a fascinating '80s curio, as is “The Making of ‘Thriller,’” a cheesy self-explanatory TV documentary that at Venice accompanied the premiere of a 3D version of Landis’ video for the Michael Jackson song. The 3D conversion is nothing to write back home about; particularly jarring is the placement of tree branches in the foreground of shots of Jackson and Ola Ray when they’re in the woods, with trees, um, behind them. Kenji Mizoguchi’s 1954 “Sansho the Bailiff” regularly makes it close to the top of almost every Greatest-Film-Ever critics’ poll. Another Mizoguchi masterpiece of the ‘50s, “Ugetsu,” recently ran in a restored version in New York, and its pictorial quality was such I thought it the ultimate black-and-white film. This is just as beautifully photographed, by Kazuo Miyagawa, and the restoration brings that to the fore. But that’s not the only thing that makes this film great. Based on a folk tale set in feudal Japan, it is one of the saddest movies ever made. A regional governor refuses to carry out orders to oppress peasants; he is relieved of his duties and sent into a sort of exile. His family, a wife and son and daughter, seek him out later and in their travels are separated. The mother is kidnapped and forced to work in a brothel. The children are sold as slaves to the brutal title character. Early in the film the father tells his son Zushio that “a man is not a human being without mercy.” Once he is a slave, and in his late teens, he forgets this, but is reminded of this by his loving sister Anju, who makes an awe-inspiring sacrifice in order to enable him to escape from Sanshu and forge a new destiny. The story is an eventful one full of cruelty and heartache. The film is also stylistically extraordinary. In his 1939 “The Story of the Last Chrysanthemum,” Mizoguchi showed his master of the moving camera, using long takes heavily influenced by Japanese scroll painting. In this movie the camera still moves, but with more nuance and subtlety. It’s as if he’s distilled the extreme sophistication of his narrative style down to its most simple components. The results are devastating throughout. One cries not just for the character but for humanity itself. Particularly today, in a time when our own social mores are degenerating into a kind of medievalism that we have become superficially sophisticated enough to designate as “zero sum.” While you’re experiencing it, one is liable not to see “Sansho” as one of the great films, but as, indeed, THE greatest film. Next Article: Venice Film Festival 2017: “mother!,” “Jim and Andy” Previous Article: Venice Film Festival 2017: "Three Billboards Outside Ebbing, Missouri," "My Generation"